Natural elements and botanical prints add a wonderful, relaxing feeling to any décor. These easy to make leaf shapes are showcased in an old window frame, creating inexpensive wall art from Krylon, great for any room. Protect ventilated workspace with newspaper. Remove glass from window frame. Sand frame with rough sandpaper to remove old loose paint, dirt and grease. Fill uneven areas with wood putty if desired. Wipe with a damp cloth to remove wood dust. Spray frame with White Primer and let dry. Measure window holes and cut six foam rectangles with serrated kitchen knife; for easier, smoother cutting, wax knife with old candle first. Draw leaf shapes on remaining foam and cut shapes with FloraCraft Wonder Cutter. Spray frame with several light coats of Khaki until covered. Let dry. Glue leaf shapes onto foam window rectangles with white craft glue. 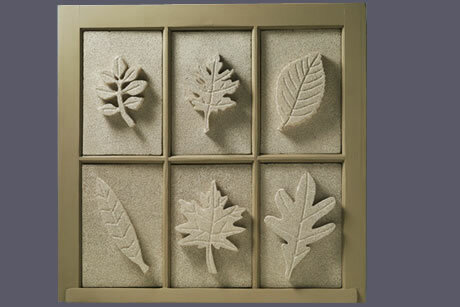 Spray leaf panels with two coats of Travertine Tan following directions on can. Secure leaf panels into window frame with duct tape on the backside. Very classy! I love the color, it made it look so sophisticated! I also love how the leaves were drawn in different shapes. Very creative! I couldn't imagine how people could be so inventive of this. It takes a lot of work but it's all worth it. Also nice in different colors. Omg! That looks so sophisticated. I needed a gift idea for my little cousin's room. I love the step by step instructions.